Whoever said, “living like a pig” was a bad thing must have spoken to Dragonlord the piglet, because he seems to agree. He agrees so much so that he has decided to swap sides. Dragonlord no longer considers himself a pig, no, Dragonlord thinks that he is a cat. 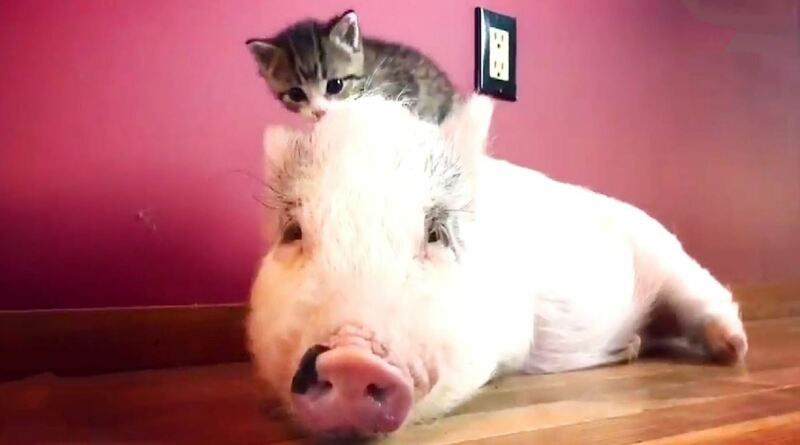 The whole story began when Dragonlord was rescued while he was still just a tiny piglet, by Caitlin. He was brought to Rancho Relaxo where he was kept inside at night because it was so cold. Caitlin also happened to have a litter of foster kittens in at the same time, one took to Dragonlord right away and started trying to take care of him. After that he felt right at home with the cats and spent most of his time hanging out and playing with them, Caitlin is sure that she even heard him trying to purr! When Caitlin moved and Dragon was a bit older she decided it was time for him to discover the great outdoors (she also had another pig that lived in the barn) but after some bad weather he got completely freaked out so back inside he came and he hasn’t been outside since! Dragonlord loves his life with his kitty family and they love having him there too. What a lovely story! Find out more about Rancho Relaxo here. Please remember to click SHARE. What He Is Doing Is Most Uncatlike. Watch His Reaction When He Is Caught In The Act!